Few events in history shook Gallatin more than when Hugh Y. Tarwater entered the office of The Gallatin Democrat on a chilly December afternoon in 1919 and fatally shot its longtime publisher, Wesley Robertson. Missouri history reveals “Uncle Wes” as the only editor shot and killed in the line of duty. 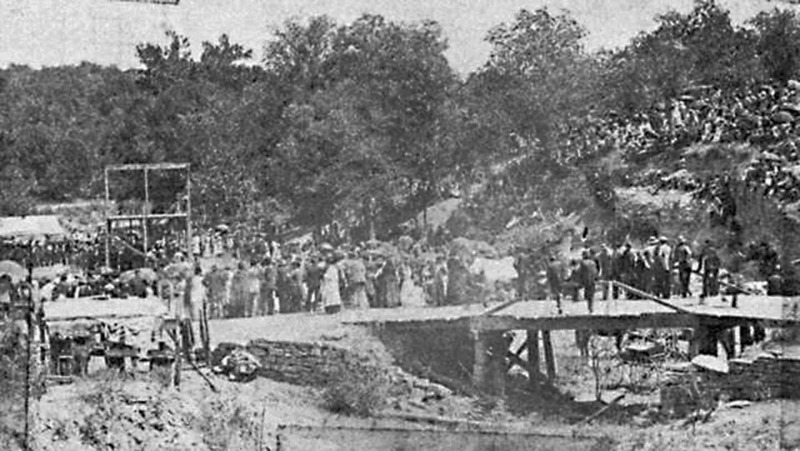 The shooting climaxed a running feud between newspaper publishers Robertson and partner Robert Ball with Mr. Tarwater, who had been city clerk for four years. Tarwater felt victimized during a crusade by The Democrat to rid the community of bootleggers. An article about Tarwater’s conviction and fine prompted a libel suit by Tarwater who sought $20,000 in damages. There was little concern by the publishers until it was discovered that the police court journal for the day Tarwater appreared in court was missing. 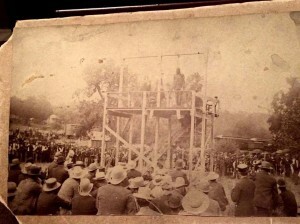 During the legal maneurvering which followed, Gallatin was hosting a Chautauqua in Dockery Park. The program included some stellar attractions and speakers of note. Uncle Wes was on the program committee. When one of the advertised speakers failed to appear, with a large crowd waiting in the boiling sun, it became Uncle Wes’s duty — or more his opportunity — to fill in. Imagine, if you will, this colorful, rotund, good-natured bundle of quick and often biting wit, leaning back on his ample haunches, inserting his thumbs into his suspenders and opening his remarks by declaring, “Had I known I would be called upon to speak, I would have worn by $20,000 suit.” The crowd roared. But the plaintiff, who happened to be in the audience, stalked from the scene red-faced and enraged. This was just a few days before the lawsuit was to have been tried. On Dec. 23, after spending the early afternoon drinking in the sheriff’s office, Tarwater left the courthouse and made his way to the newspaper office. There was a commotion and a shot. Robertson, who had been standing by his rolltop desk, slumped to the floor. There was some speculation about how Tarwater may have been provoked into confronting Robertson with a loaded .32 pistol and the fact that a sheriff’s car pulled up at the newspaper office to whisk Tarwater away before any alarm could be telephoned. The Daviess County Court, which functioned as commissioners, along with Sheriff J. Atch Blair, were Republicans and often targets of The Democrat’s editorials. The funeral for Uncle Wes was perhaps the biggest in Gallatin’s history. Robertson was a popular community leader, even serving as Gallatin’s official Santa Claus during the holiday seasons. Tarwater was tried for murder in Gallatin on Oct. 4, 1920. 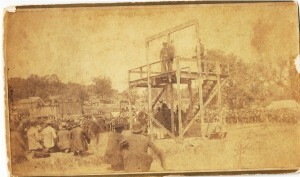 Immediately after the shooting of Robertson, Tarwater suffered a nervous breakdown and attended his trial in a wheelchair. The trial lasted eight days. The defense was based on insanity. In failing health heightened by stress, Tarwater was found guilty by a circuit court jury and was sentenced to 35 years. Tarwater appealed to the Missouri Supreme Court, which affirmed the decision. 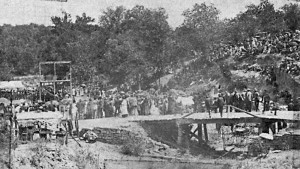 He arrived at the state penitentiary in Jefferson City on May 21, 1922. From time to time, Tarwater’s application for parole or pardon met strong opposition from Missouri newspapers. He finally died in the penitentiary, and his burial was in Lile Cemetery on the west side of Gallatin. He was survived at the time of his death by his widow, a daughter who was living in California and a son living in Arizona. “At midnight Friday old John Barleycorn became a fugitive from justice and was outlawed in every state in the Union. National Prohibition went into effect and the entire country is up in arms against John, who reiungned supreme for so many years. “The smiles he brought and the good times he was reputed to have given to so many are things of memory only, but the trail of desolation, heartaches, blasted hopes and ruined lives are the things of reality he has left strewn all over America. They will serve to remind not only this generation but future generations of the curse to mankind. Robert J. Ball was junior manager of the Gallatin Democrat at the time that outraged city clerk Hugh Tarwater shot and killed Wesley L. Robertson on Dec. 23, 1919. Tarwater also shot at Ball but he escaped without injury during the incident which unfolded in the printing office on North Main Street just off the square. Not long afterwards, Ball departed for Colorado.